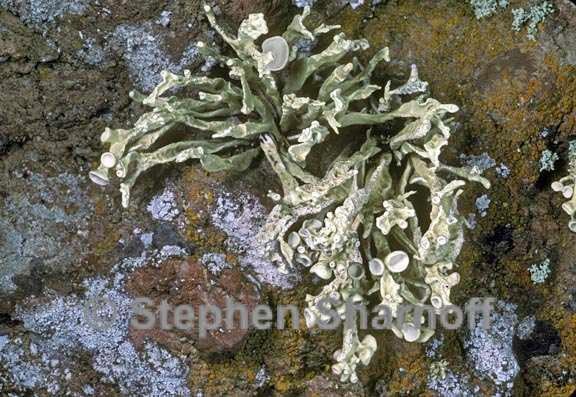 Thallus: fruticose, caespitose and tufted, sparingly branched branches: irregularly compressed and ridged, occasionally flattened, up to 6 mm in width surface: greenish yellow, crinkled, irregularly lacunose medulla: white, lacking thick aggregations Apothecia: primarily terminal, in clumps of threes or solitary, up to 5 mm in diam. disc: pale green, concave asci: clavate, 8-spored ascospores: hyaline, 1-septate, fusiform, straight or gently curved, (10-)12-14(-15) x 3-3.5(-4) µm Pycnidia: black, immersed conidia: straight, rod-shaped, 4.5 x 1.5 µm Spot tests: negative or K+, P+ when salazinic acid present Secondary metabolites: bourgeanic acid, (-)-16α hydroxykaurane, zeorin, +salazinic acid, usnic acid. Substrate and ecology: coastal rocks and cliffs, but extending to more xeric inland habitats than other Nieblae World and Sonoran distribution: central to southern California coast, including the Channel Islands, and Baja California. Notes: Niebla polymorpha often occurs with N. ceruchoides at the immediate coast, but it has a broader ecological range, occurring further inland and in drier microhabitats than other Nieblae. It has a densely clumped thallus, but its sparse branching, much thicker blades lacking divaricate branching at the tips, usually wrinkled cortex, and much larger apothecia all make it easily distinguished from N. ceruchoides or N. robusta with their larger, inflated blades. It has black pycnidia, occurring mostly along the ridges of the blades. The conidia are straight, 4-5 x 1.5 µm. This Niebla species can occur in dense stands on ocean facing cliffs, or as isolated individuals at the interior of its range. It is often the first colonizer of a site, and frequently occurs as solitary thalli as the only Niebla able to inhabit dry, apparently marginal sites.